School is fast approaching! What do you plan to do during that first week to begin to establish relationships with students? To get some insight into their math skills? Read the Room: Ask your students to "read the room" to find 5 things that either interest them or might help them in their work. Then ask students to work in pairs or triads to compare notes, and to categorize the items they noted. In your room are math-y posters, classroom expectations or rules, standards, essential questions, maybe Bloom's Taxonomy, posters on growth mindset, a calendar, stacks of textbooks, classroom supplies, etc. In reading the room, students become familiar with the environment! Stations: Ask students to work in groups to complete the stations. Stations review basic skills in preparation for the first unit. Here is a sample of stations I have used with Algebra 2 students. Snowballs: Give students 2 half-sheets of paper. On one slip ask them to list 2- 3 things they like about math. ON the other list 2 - 3 things they don't like about math. Students crumple the paper, and toss around the room like a snowball fight. Students pick up random snowballs to read aloud to the class. Teacher makes a list - the goal is to identify commonalities. 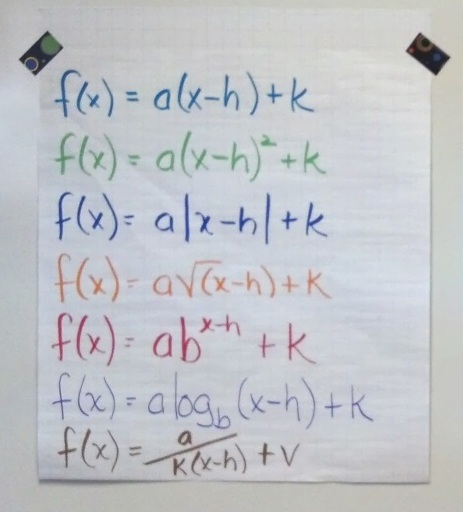 In our Algebra 2 course the year is built around several functions. 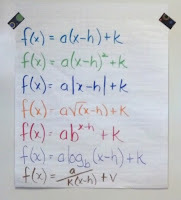 So in the first week, we spend some time analyzing these equations. I ask students what they notice. I collect ideas. Then I give them time to think about what they wonder. I collect those ideas. I post the ideas around the room in that first unit. At the beginning of the year students are sometimes reluctant to share - and they struggle with reason and wonder. They get better at it during the year with practice. Pass the Ball. Since we study functions all year, it's fun to start with a data collection and analysis activity. This one incorporates learning student names. In its simplest form the activity data should create a linear function. To create quadratic data, each student says his own name, and the names of those who came before. So I say my name and pass the ball; the next student says his own name and my name before passing the ball. The third student says his name, the student before, and my name before passing the ball ... etc. Before collecting this data it is helpful to discuss a few questions briefly. Why is learning to analyze data significant? What are keys to collecting useful data? After collecting the data, students could use Desmos or the TI 84 calculator to analyze the data. Number Strings: Math Talks and Number Strings are ways to build numeracy. Using number strings in the first week can give you insight into your students' numeracy strengths. Check out these two resources Number String Website and the pdf download for ideas! Consider making number strings a weekly activity! This or That Icebreaker: students choose between 2 choices and move to one side of the room. They share why they made that choice. Example ... would you rather have a dog or a cat for a pet? Would you rather play video games or a sport? Make a list of 10 questions! Check out this site for ideas. Hexagon Design Thinking ... each student gets one pre-cut hexagon. Ask them to write a favorite activity on it. Then students gather around a table and connect their hexagons. Glue the hexagons down for an instant map of students' favorite activities - and instant classroom decor! How many hot dogs did they eat? This is a fun 3-act math task. The math is easily within reach of Algebra students but complicated enough to provide opportunity for conversation and thinking. It will be interesting to see how students go about solving the problem ... will they make a table? will they create an equation? will they use some other strategy? Work of Mathematicians vs Students: How does the work of mathematicians differ from the work of students in math classes? Invite students to read this article about the work of mathematicians! Discuss the article in class and ask students to reflect on it in writing. Or jigsaw the article. Distribute parts of the article to each team. Groups read the passage they’ve been given and identify key attributes of the work of mathematicians and/or the typical classroom. Students write phrases on cards, and place their information on the Venn Diagram chart at the front of the room. What is (a + d) - (b + c)? Always? What is (a^2 + d^2) - (b^2 + c^2)? Always? Will a + b + c + d always be positive? negative? Explain. Why can (ac - bd) never, ever, be even? What is bc - ad? Always? Which consecutive numbers are such that the sum, a + b + c + d, is divisible by 3? Explain. Why can’t the sum, a + b + c + d, be a multiple of 4? Why is (abcd) divisible by 24? Questions from Don Steward's work. Use Three 3’s in a Row from Total Participation Techniques to organize this activity. That means, type those 9 questions in a 3 x 3 grid - leaving space for students to write down key ideas. Give students 3 to 5 minutes to think about the questions without writing anything. Then invite them to mingle around the room … to find someone who can explain one of the 9 questions. Students take notes on each other’s ideas … and then move to another classmate. After allotted mingling time, debrief as time allows. (It is not necessary to answer all 9 questions in class) See a previous post on TPT strategies for a description of Three 3’s in a Row. Four 4’s: Create math expressions using four 4’s and any operations to equal the numbers 1 to 20. Enter expressions on a chart on the board. Challenge students to find sums to 50. What do you do on the first day of school? What are you planning for the first week of school? Will you post a link to your blog in the comments? I love the number explorations for the first day. I think I'll use this in my Algebra 2 class to push them to generalize and justify, while working together. BTW - you could do a gallery walk - pairs working together - put their response on sticky notes.